For additional information about this book, visit the website www.drivingtoperfection.com. Your most important strategic and competitive advantage is right in front of you—grow your culture, and you’ll grow your company! Driving to Perfection: Achieving Business Excellence by Creating a Vibrant Culture is not your average business book. It was written by someone with 25 years (and counting) of hands-on business experience who has been (and still is) in your shoes and successfully guided his company to exponential growth. During this time, author and business leader Brian Fielkow has learned that the best way to achieve sustainable excellence is by fostering a vibrant company culture. In this book, Fielkow provides concrete advice for managers and executives looking to take their companies to new heights. This book is packed with “hands on” ideas you can readily adapt to your organization. • Have you sought expensive outside consultants in the hope of increasing employee morale, your bottom line, or both? Your answers are in-house and Fielkow will show you how to discover them. • Can you identify how your culture is contributing to the success—or failure—of your company? • Have you taken the time to anchor your company’s positive culture so that it rises above inevitable obstacles and withstands the economic cycle? Regardless of the size of your company, Fielkow has found that active employee engagement around culture translates directly into corporate prosperity. And his findings can work for you, too. In a business world full of uncertainty, Driving to Perfection is the roadmap you need to get your company where you want it to be. Author Brian Fielkow is president of Houston-based Jetco Delivery, which provides trucking and freight services along the Gulf Coast. Before purchasing Jetco, Brian held positions as executive vice president of Recycle America Alliance, a subsidiary of Waste Management, Inc., and as chief operating officer of a privately held recycling company. A Wisconsin native, he has lived in Houston since 2003 with his wife and three children, and has developed a proven formula that directly ties a company’s culture to its bottom line. Fielkow holds a B.A. from the University of Wisconsin Madison and a J.D. from Northwestern University School of Law. 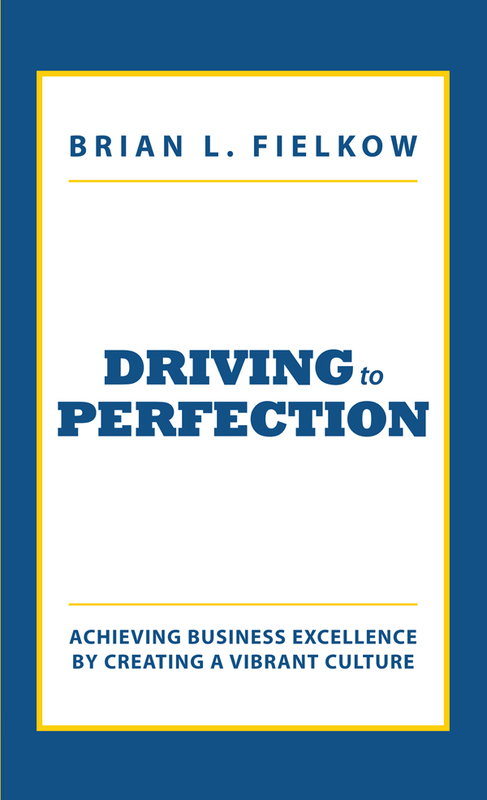 Brian wrote Driving to Perfection: A Personal Journey—Achieving Business Excellence by Creating a Vibrant Culture based on his 25 years business and leadership experience. During this time, Fielkow has learned that fostering a vibrant company culture is the best means to ensure sustainable excellence. Yet, this challenge remains elusive for many entrepreneurial and privately held companies. Driving to Perfection does not focus on the theory behind company culture. Rather, the book explores how a business, no matter the size, can achieve excellence through intense focus on the development and nurturing of its culture. Brian Fielkow is President of Jetco Delivery, which provides trucking and freight services in the Gulf Coast. Before purchasing Jetco, Brian’s experience included roles as executive vice president of Recycle America Alliance, a subsidiary of Waste Management, Inc., and chief operating officer of a privately held recycling company. He has spoken to thousands of people on the topic of company culture, and continues to share his experiences with audiences so they have the tools to cultivate a thriving company culture of their own. Brian holds a J.D. from the Northwestern University School of Law and a bachelor’s degree from the University of Wisconsin. He lives in Houston with his wife and three children.